Huangshi Village, literally means Yellow Stone Village, is also known as Yellow Lion Village. 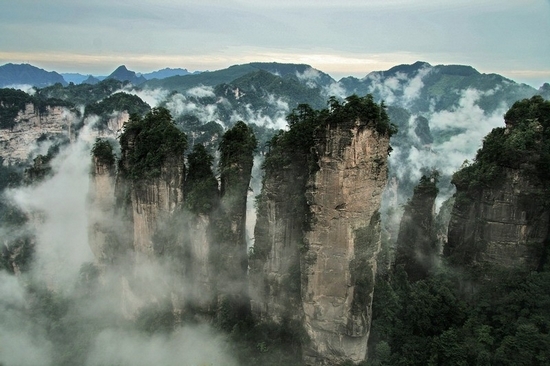 It is one of the attractions which are strategically located and difficult of access in Zhangjiajie. It is about 800 meters above the ground and 1100 meters above sea level averagely. The village is characterized by the jagged rocks, overhanging cliffs, high staking platforms, and elegant apexes. Tourists could enjoy the essence of the scenery on the observation deck. By walk: Walk forward for about 5min from the entrance of the forest park, arrive at Yangba Square(氧吧广场), and then you will see stone steps left front. Walk along the steps for about 2.5 hours. You will arrive at Huangshi Village.